The Volkswagen Type 1, commonly known as the Volkswagen Beetle, Volkswagen Bug and Volkswagen Käfer, is a two-door, four passenger economy car manufactured by German automakers Volkswagen from 1938 to 2003. Please note that this article is not about the Volkswagen New Beetle (1997 – 2010) or the Volkswagen Beetle (A5) from 2011. 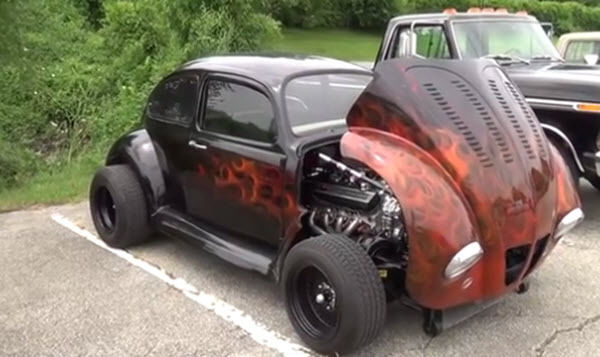 A hot rod bug. Click the image to see a video. The Volkswagen Type 1 was produced in huge quantities and sold in many different parts of the world, which meant that a lot of people are familiar with the Volkswagen and there will be a lot of professional and hobby mechanics that knows how this car works. Also, finding spare parts or special parts that will fit the Volkswagen Type 1 is not a problem. The Volkswagen Type 1 was always intended to be an economy car. It was affordable right from the assembly line and it was even more affordable as a second hand car. Today, prices have began to go up a bit for well-maintained Volkswagen Type 1 cars, since the car is no longer in production, but it is still possible to find a quite affordable Volkswagen Type 1 to hot rod. This is especially true compared to the current price of classic Ford Mode Ts and Model As, which used to be the go-to choice for hot rod builders in the United States but are now rather scarce and pricey. Compared to many other cars, the Volkswagen Type 1 is easy to work with and the flat four motor is a joy to tune. The Volkswagen Type 1 is cheap to maintain and finding spare parts is not difficult. Unlike most other cars, the Volkswagen Type 1 has an air-cooled horizontally opposed engine. Compared to more complex water-cooled engines, the Type 1 engine is easy to repair, and modification also becomes easier with this configuration. Keeping the weight over the rear wheels maximizes grip off the starting line when drag racing. When a Volkswagen Type 1 is modified for drag racing, it is usually stripped of “unnecessary” weight and this further improves grip. 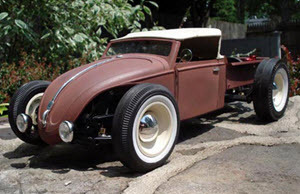 A volkswagen beetle turned into a hot rod is sometimes called a volksrod, especially by those who wish to make a distinction between Ford-based hot rods and other “rods”. Many volksrods are built using basic mechanical tools, welding equipment and inexpensive parts, but it is of course possible to use as expensive parts and methods as you like and can afford. 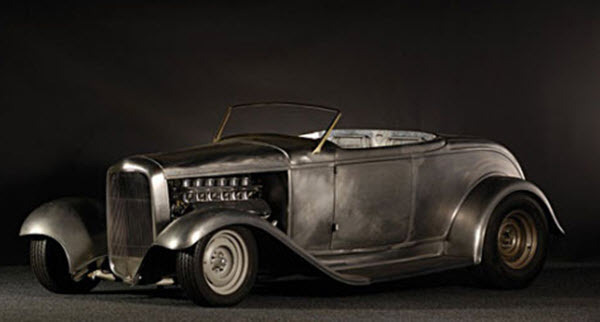 One example of a popular volksrod is the one where a classic Ford front axle has been installed to move the wheels forward, which gives the car a low and stretched look. Another popular modification is to move the original axle beam forward or reverse the trailing/torsion arms and adjust the steering linkages. When it comes to pure aesthetics, popular paint jobs include flat black with pin-striping. Black Current is a Volkswagen Beetle that has been rebuilt from the foundations up and fitted with an electrical engine and the associated parts required for this engine. It is chiefly used as a drag racer, and serves a scientific purpose by pushing the borders of what’s achievable with an electric car. At the time of writing, the Black Current speed record stands at 135 miles per hour (217 km/h). In 2011, a Black Current created by Olly Young reach 0-60 mph (0-96.6 km/h) in 1.6 seconds, thus proving to be a whole second faster to 60 than the Bugatti Veyron. The functional objectives for the Volkswagen was formulated by Adolf Hitler, who wanted to mass-produce an affordable car for the new German road network. Ferdinand Porsche was contracted to design and construct the Volkswagen. Production commenced in 1938, but during World War II production numbers were kept low since resources were diverted to the war effort. 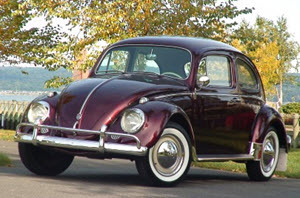 In 1938 – 2003 a total of 21,529,464 Volkswagen Type 1 were built. 15,444,858 of these were built in Germany (including 330,521 cabriolets) and approximately 3,35 million in Brazil. The Volkswagen Type 1 is the most-manufactured car of a single platform. In Germany, the car was affectionately referred to as Käfer, which means beetle. This idea was used in the marketing of the car in several other countries, e.g. Beetle in English speaking countries, Escarabajo in Spanish speaking countries and Coccinella (ladybug )in Frech speaking countries.